The source code of this example can be found under "Examples\Advanced (Office2007 UI and more)\" subfolder of the MVC# root folder. The framework itself can be downloaded from www.MVCSharp.org/download.aspx. In the earlier articles (here and here - read them prior to proceeding) we have got acquainted with MVC# - a framework for simplifying the usage of the Model-View-Presenter pattern in .NET applications. We have covered all basic requirements and scenarios of using the MVP architectural pattern. However in the real-world conditions application's requirements diverge from those basic ones. Complex applications often demand for an advanced customization and fine-tuning. And, of course, robust frameworks should cope well with such specific requirements. This article steeps deeper into the MVC# framework capabilities demonstrating its advanced usage scenarios. These scenarios range from extending view and task descriptions to customizing navigation and presentation styles. Each advanced feature is covered in a separate article section and may be read independently. The major drawback of many existing MVC/MVP frameworks is that they require certain UI components to be used with them. For example the ASP.NET MVC framework comes with its own set of UI elements, CAB (Composite UI Application Block) is either not compatible with many 3rd-party components. With such frameworks a developer finds himself restricted in choosing the UI components he likes. MVC#, on the other hand, does not impose any limitations of such kind. Developers may use MVC# with any 3rd-party library they are committed to. 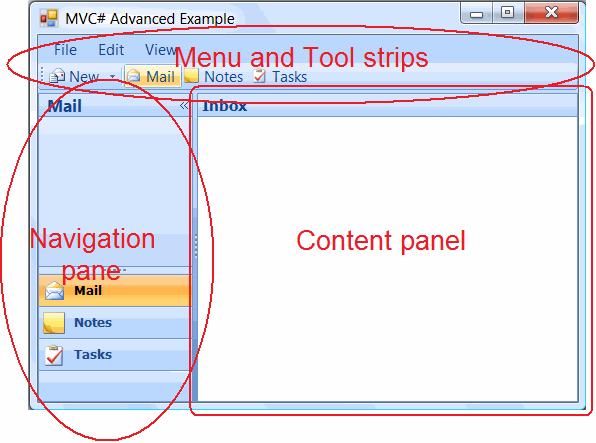 In this article we are using MVC# with 3rd-party UI components for creating Office 2007-like user interface. The main form of our application will be constituted of menu with toolbar strips, an Outlook-like navigation pane on the left and an Outlook-like content panel on the right (see the picture below). To apply the Outlook 2007 style to the menu and toolbar strips we will use an open-source 3rd-party renderer component by ComponentFactory (downloadable from here). The Outlook-like navigation pane we will use is the open-source component by Muhammed Şahin (get it here). And the Outlook-like content pane is the slightly modified Outlook-style panel from http://www.openwinforms.com. By now we should have only placed the said 3rd-party controls on the form and set their basic properties. Later on we will handle events from these controls and make them interact with the framework. When a user selects an item in the navigation pane an appropriate view should be shown in the content pane on the right. In MVC# the way of switching between views is defined by the views manager class. Therefore the desired kind of navigation can be implemented by writing a custom WinformsViewsManager subclass - OutlookLikeViewsManager. // If it's main form then access its content panel. Since the controller type is left unspecified above then the default controller for the Notes category should be used - NotesController class. In the above code an interaction point with unspecified controller type gets associated to one of the default controller types (depending on the view category - see the switch construct above). And then the controller is created with this type. Another option is applying the custom navigator class globally via the MVCConfiguration.NavigatorType property. Throughout this article we have studied a number of advanced MVC# framework features. These features help dealing with complicated application's requirements which often appear in real-world projects. With the discussed customization techniques developers can fully harness MVC# power to creating complex Model-View-Presenter applications.